To mark the Queen's 90th birthday Terry Keen, a 69-year-old tenant at Anchor's Willow Glade retirement housing scheme in Surrey, embarked on a 1,500-mile cycle ride in 2016, visiting 90 Anchor locations across the country, asking customers and staff to sign a very special birthday card. 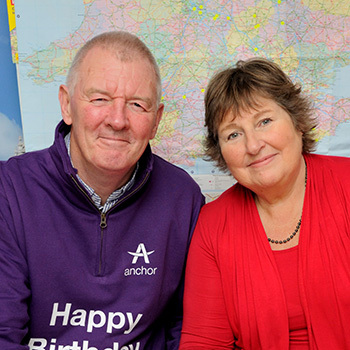 Terry set off on his journey on 14 March 2016 and presented the specially designed card, featuring a photo of Anchor customers and colleagues forming the number 90, to Buckingham Palace in May at the start of Her Majesty's birthday celebrations. Beginning his journey at King James Court retirement housing scheme in Berwick-upon-Tweed, Terry cycled across England and end up at The Clies in Heston, Cornwall, on 9 May 2016. As part of his journey, Tour de Terry, he raised an amazing total of £7,344.27 for Grandparents Plus, the national charity which champions the vital role of grandparents and the wider family in children's lives - especially when they take on the caring role in difficult family circumstances. The charity is very close to Terry’s heart, he has been married to his wife Jacquie for 50 years and has four children and 11 grandchildren. They understand the important role grandparents and wider family members play in raising children and felt inspired to raise money for Grandparents Plus because he has friends who are raising their grandchildren. As well as raising money for Grandparents Plus and celebrating the Queen’s birthday, Terry hoped undertaking this challenge will inspire other older people for years to come. 69-year-old Terry has completed 27 marathons, cycled from Lands End to John O’Groats and cycled from England to Budapest. He is also a fully qualified former Fitness Coach, specialising in older people's outdoor/indoor fitness programmes. Terry believes that age should not pose a barrier to new experiences and hopes to inspire others to overcome their own challenges in life, no matter how old they are. Terry blogged about his journey every week and shared his experiences along the way on Twitter using the hastag #TourDeTerry..